Disability Sports Australia (DSA) hosted the GIO 2018 International Wheelchair Rugby Federation (IWRF) Wheelchair Rugby World Championship at Sydney Olympic Park from 5-10 August 2018. DSA is Australia’s peak national body representing athletes with a physical disability. DSA marshals the organisation of 10 highly active mainly state-based wheelchair and physical disability sports groups and is the governing body for wheelchair rugby in Australia. The Australian Government, through the Department of Social Services, supported the 2018 Championship. The event provided the opportunity to promote International Day of People with Disability on a national and international basis. It promoted inclusive and accessible communities, and promoted the health and wellbeing of people with disability – key outcome areas of the National Disability Strategy 2010-2020. The Championship is held every four years around the world and 2018 was the first year the event was held in Australia. 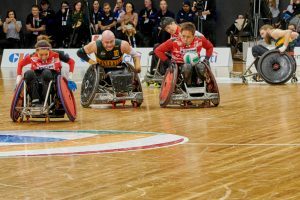 Over 5,000 spectators attended throughout the week, with over 2,200 attending the finals – the largest crowd in Wheelchair Rugby World Championship history. View photos from the GIO 2018 IWRF Wheelchair Rugby World Championship.